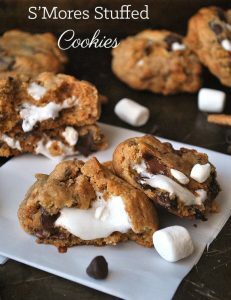 S’mores cookies are a delicious twist on your favorite campfire treat! These cookies are soft and chewy, filled with graham crackers and chocolate, then stuffed with gooey marshmallows for the ultimate s’mores dessert. I don’t know if you’ve noticed, but I kind of have a thing for cookies. Well, much more than just “a thing,” but it’s not like we are exclusive or anything either. I also have a bit of a “thing” for challenges. I came across a few recipes for cookies stuffed with marshmallows which looked out-of-this-world incredible, but every single comment on the recipe notes that unless they used vegan marshmallows, the marshmallows would disappear during baking. Now, I don’t have any issues with vegan marshmallows. They taste okay, but the texture isn’t my favorite. Every vegan marshmallow I’ve tried (and I’ve tried a lot of vegan marshmallows in my time), always seems a bit tough and a little too chewy. I can certainly see how they would be able to stand up against the heat without any issues. Plus, they are a little bit better for you. Aren’t they? My main concern here is the fact that not everyone is going to have ready access to vegan marshmallows and not everyone will want to have to order them online or make their own. So my challenge here was to make a marshmallow stuffed cookie without them disappearing. And I think I’ve just about cracked the code. There are actually many recipes using non-vegan marshmallows to stuff cookies. But the melting issue was there with these recipes, too. I actually spent countless hours trying different methods. Some resulted in marshmallows that dissolved within minutes (Boo! ), others managed to last a couple of hours. The trick, as it turns out, is to get the dough as cold as possible without freezing them, and getting the s’mores cookies to cool quickly, without putting them in the refrigerator. 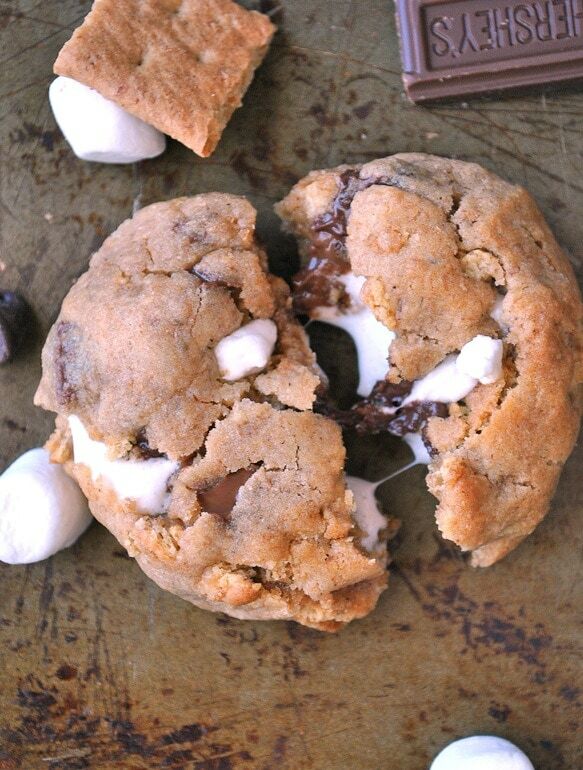 Saying that, these S’Mores stuffed cookies can be made ahead of time, up to three days in advance. When you form the s’mores cookies, it is also important to keep the top cookie thinner than the bottom. The marshmallows will be able to stand the heat while in the oven when they are a little more exposed. The thinner top allows the marshmallows to lower their temperature faster once they are out of the oven. Which is the critical part. You can put these cookies by a window or near a fan to help the process. I have also noticed that there is a difference with how you bake them. These cookies bake better in a convection oven and you are almost guaranteed success if you are using a convection oven (or using “convection bake” if your oven has the option of doing that or just “bake”). Non-convection ovens tend to need a longer bake time and can dissolve the marshmallows more easily. I recommend checking on the s’mores cookies every minute past 8 minutes if your cookies still look very raw at the top. Please also note that, in general, s’mores stuffed cookies will look under baked. This is normal. We want them under baked, because that’s what makes them soft and chewy. They continue to bake while on the baking sheet. 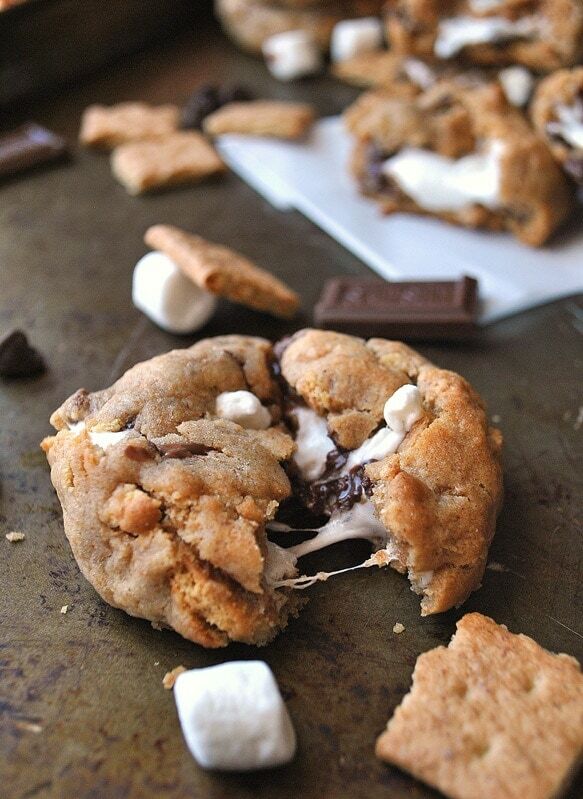 S’mores stuffed cookies take a little extra time and love to make, but they are worth it. Trust me, they are worth it. 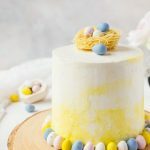 If you like this recipe, sign up for my newsletter and get the latest awesome desserts delivered straight to your inbox! Don’t have time to make these delicious cookies now? Pin it for later! Slowly add the eggs one at a time, then the vanilla. Slowly add the eggs one at a time, then the vanilla. Beat well, then slowly add the flour mixture and beat until just incorporated. Stuff 4 - 5- mini marshmallows into the indentation. Make sure they are tightly packed in. Top with another 2/3 tablespoon of cookie dough and press together until the dough completely covers the marshmallows. Repeat with the remaining dough and marshmallows. If you want to learn how to cheat this recipe, take a look at the note below this recipe! Cheat the recipe: Roll the cookie dough without the marshmallows into balls 2 tablespoons big. Bake for 8 - 10 minutes. Once cooled, toast marshmallows and use the cookies to sandwich them. These look awesome. 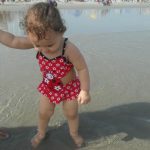 I’ve pinned but also saved to ziplist! I’m going to make these soon. Yay, thank you!! Please let me know how they turn out! 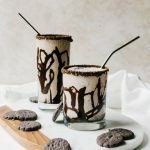 I am in the process of making these – I’m not seeing where to put the chopped up milk chocolate?? You put it in with the chocolate chips. Sorry, I should have been more explicit! PLEASE tell me how they come out, or better yet, share pictures! Hi, I am making these for a Thanksgiving get together at work, can you tell me how many cookies this recipe yields? They make about 18 cookies, but they are best served straight from the oven! OH my, the gooey goodness of the chocolate gods have graced your cookies! You did a wonderful job and I so enjoyed your pictures!!!!! Tweet,pin,follow!! Coming over from SITS FB group, nice to meet you! I am glad you like it! It look be ages to get them that gooey! Following you back! OMG. I want to lick the screen. Oh look! I have ALL the ingredients! Hmm. What’s a pregnant girl to do but bake?! Wow – you really know how to make a girl blush! I am currently using a Nikon D3000 with a 18 – 55 mm lens. It is an older camera, but it does the job just fine! Good to know! The camera I’ve been saving up for is a Nikon D3100, with just the 18-55mm lens. It’s my first venture into the DSLR world, shockingly pricey for a cheap girl like me, but I want pretty pictures, especially for my etsy store. Thanks for replying! When I weigh 400 lbs, I am totally blaming it on your blog! Another amazing recipe! It is my secret evil plan to make everyone gloriously heavy but incredibly happy! Mwahahaha!